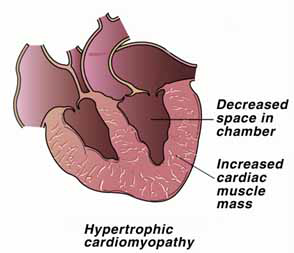 Cardiomyopathy is a term used to describe diseases of the heart muscle. In cats, three classes of cardiomyopathy have been described: hypertrophic, dilated and intermediate (restrictive). In all classes, the heart disease usually results in clinical signs of heart failure. Cardiomyopathy may be seen as a primary condition or secondary to other diseases. In the early stages of disease, the cat may be able to cope and will not show any signs of disease. This is referred to as compensated heart disease. Often the cats will alter their activity levels to those that they can cope with which makes it difficult to diagnose cardiomyopathy until it is quite advanced. Pain, discomfort, or just not feeling well may manifest in other less obvious ways. Pain or discomfort from any source/cause often causes cats to act out of their ordinary routine. They may hide, be less social,and have different eating habits and/or different elimination habits which often means not using their litterbox to urinate and/or defecate. They also may not feel strong enough to get to their litterbox, food and/or water. Sick or painful cats are not being spiteful or acting out of anger, just out of distress, weakness, illness. It is their natural instinct to behave this way. In the wild, a sick cat is a weak cat and a weak cat is a potential victim. Changing their normal routine and/or demeanor may ward off a potential predator. So you see,what seems abnormal to the untrained human eye is actually normal to the feline survival instinct. Labored breathing and lethargy are the most frequently noticed signs of congestive heart failure and result from failure of the heart to efficiently pump blood. Altered flow of blood in enlarged heart chambers increases the risk of blood clot formation within the heart called a thrombus. If parts of the thrombus become dislodged,they can travel in the bloodstream and block smaller blood vessels. These traveling blood clots are called emboli and the most common place for them to lodge is at the bottom of the aorta. This results in obstruction of the blood supply to the back legs, which is very painful and leads to paralysis. Although some cats may recover with appropriate treatment,this is a potentially fatal complication of any cardiomyopathy. Emboli can also lodge in any other part of the body including the lungs leading to difficulty breathing and the brain resulting in a stroke. High blood pressure, or hypertension, is a possible complication seen in many cases of hypertrophic cardiomyopathy (HCM). (Hypertension,especially if left uncontrolled, can also be a cause of HCM.) This may result in spontaneous bleeding, such as nose-bleeds or hemorrhage within the eye and may also cause retinal detachment and blindness. This may be noticed as a sudden loss of vision and a widely dilated pupil(s). This is an emergency situation since the blindness will be permanent unless the retina is reattached within a couple of days. Uncontrolled high blood pressure can also make cats feel anxious and restless (which can lead to excessive howling/meowing), inappetant, thirsty and just overall not well. It can also cause strokes, and damage to the heart and kidneys, Drugs that lower the blood pressure may be used to treat cats with this problem. We can measure blood pressure in our office in just a few minutes. It is very similar to the way it is done in people. Examination of the eyes may give early indications of hypertension since the blood vessels of the retina may show changes and small hemorrhages may be seen. 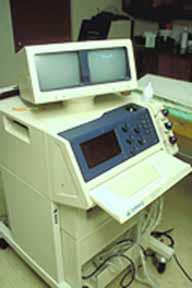 Diagnosis of heart disease can be suspected on the basis of clinical signs (weight loss,difficulty breathing, blue-purple color to the gums, abnormal heart rate and/or rhythm, heart murmur, vision problems, and other signs listed above), chest x-rays, electrocardiography (ECG) and cardiac ultrasound scans. Other tests may be done in order to check that the cardiomyopathy is not secondary to some other disease such as hyerthyroidism or high blood pressure. There are many causes of cardiomyopathy; however, in older cats thyroid disease(hyperthyroidism) commonly causes cardiomyopathy. Other causes include a rare cause is dietary deficiency of taurine, an essential nutrient. This is not seen in cats fed a commercial cat food since all of these are supplemented with taurine nowadays. In cases where an underlying cause of the heart disease is found, then treatment of this condition may result in improvement or reversal of the heart disease.Hyperthyroidism is the most treatable cause of cardiomyopathy since complete resolution of the heart disease is possible if diagnosed and treated early. In cases where no cause is identified (referred to as idiopathic cardiomyopathy) and in cases where disease remains following treatment for an underlying cause then medication may be needed. Beta blockers to reduce the heart rate where this is excessive. Calcium channel blockers to help the heart muscle relax and hence help more effective filling of the heart. Aspirin may be used for its effects at reducing the risk of thrombus formation and thrombo-embolic disease. Dosing of aspirin should always be as advised by a veterinarian since as pirin may be toxic to cats. Aspirin poisoning, which occurs if the dose or frequency of aspirin administration is too high, may cause vomiting and internal bleeding. If your cat shows these signs, stops eating or appears sick, aspirin therapy should be stopped and you should consult your veterinarian immediately. ACE inhibitors - these drugs also help to control congestive heart failure. Low sodium diets, such as Hill’s K/D, are recommended for cats with cardiomyopathy. This may decrease the risk of developing congestive heart failure and hypertension. Cat treats are often quite salty and should be avoided. We may make specific dietary recommendations for your pet’s condition. Overall it is most important that your cat eats so if your cat will not eat the recommended diet(s), feed your cat whatever cat food he/she will eat.